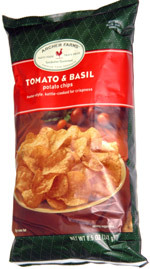 Taste test: These kettle-cooked chips were very crunchy and had a lot of tasty tomato basil seasoning. Most of the chips were smallish and very wiggly. As with many varieties of Target's Archer Farms line of potato chips, these were enjoyed by most of our tasters. Smell test: Pretty good tomatoey smell, with lots of spices.